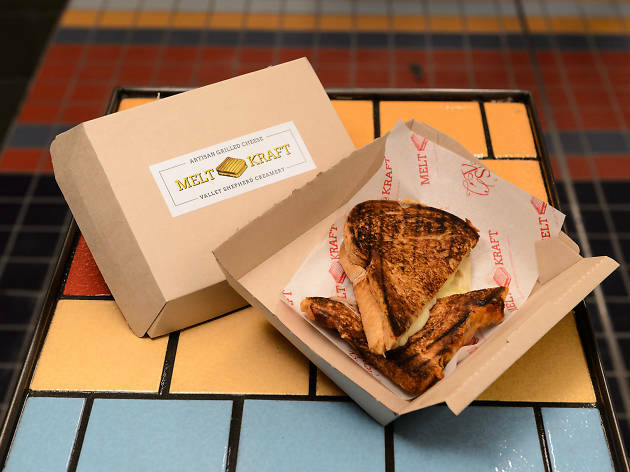 NYC best food halls and food courts take the lively, bustling atmosphere of NYC street fairs and combine it with some of the city’s best and trendiest food offerings—what’s not to like? 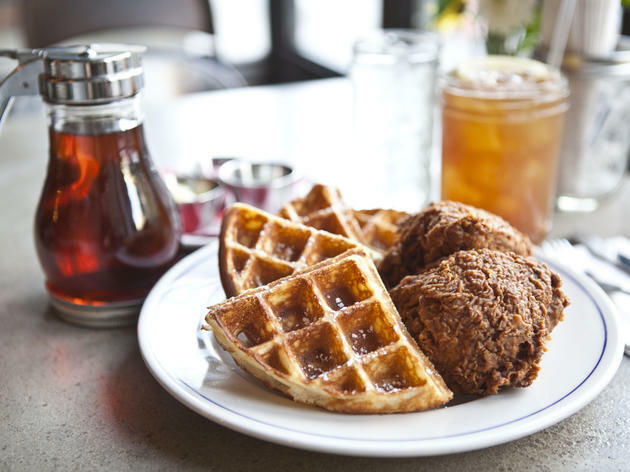 Some spots are ideal for quick and cheap eats, while others can be surprisingly high-end, but all provide the perfect solution to bickering with coworkers over what to eat for the best lunch in NYC. 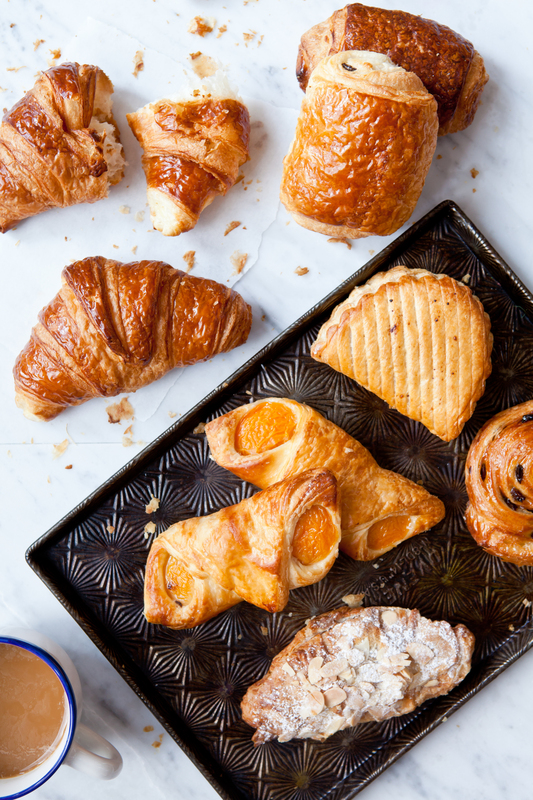 Take this guide and your squad to your nearest NYC food hall and sample to your stomach’s content. 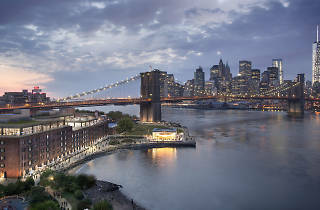 And of course, keep your eyes out for the opening of the Time Out Market opening right in DUMBO! 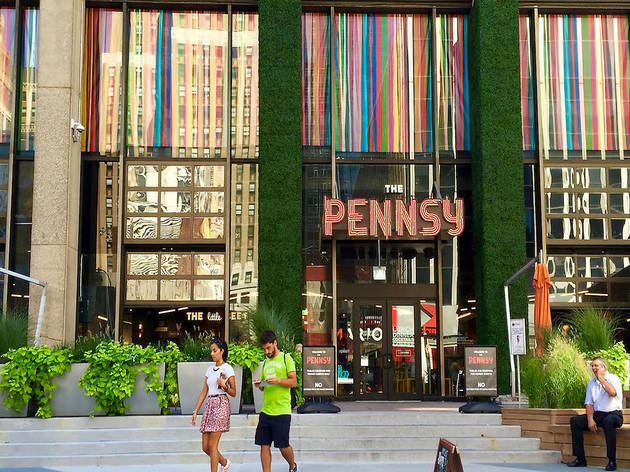 We really like eating around the city, and we're guessing you do, too. 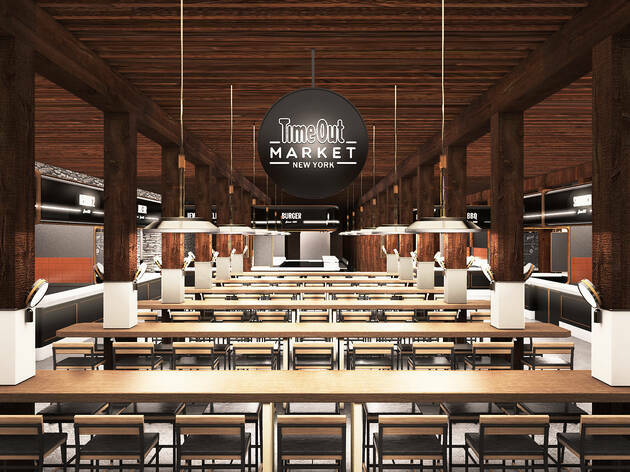 So lucky for all of us, we're packing all our favorite restaurants under one roof at the Time Out Market New York. 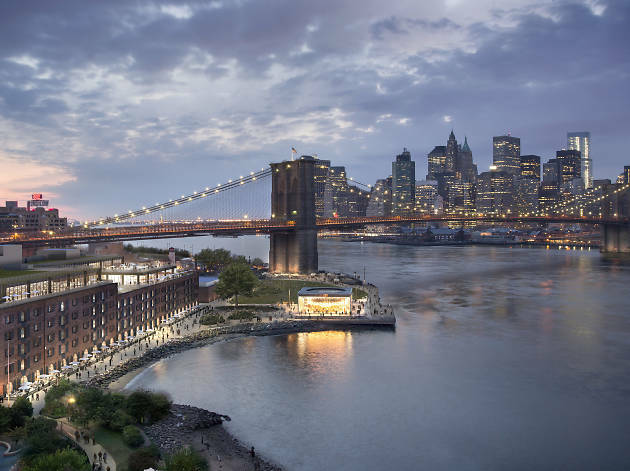 The DUMBO location in Empire Stores will have fluffy pancakes from the venerable Clinton Street Baking Co., thin-crust pizza from Patsy Grimaldi’s Juliana’s and Japanese comfort food from Bessou, to name a few. 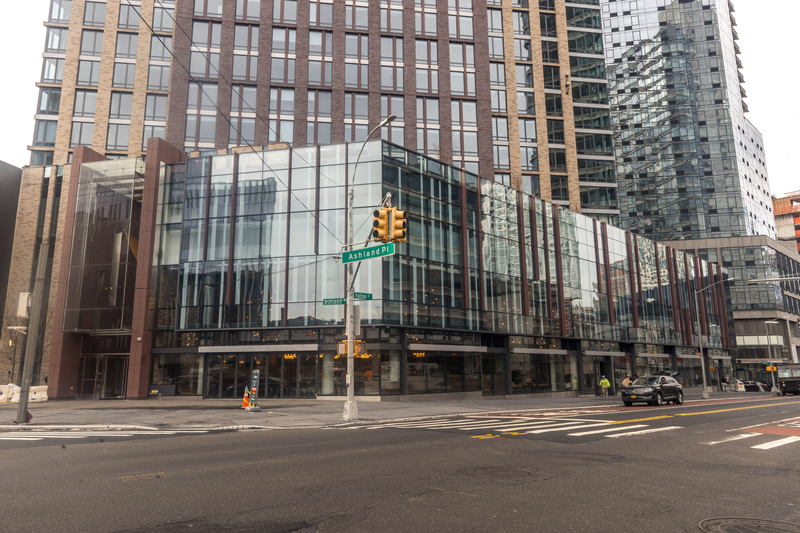 Stay tuned for more information regarding the Spring 2019 opening—we can't wait to see you! 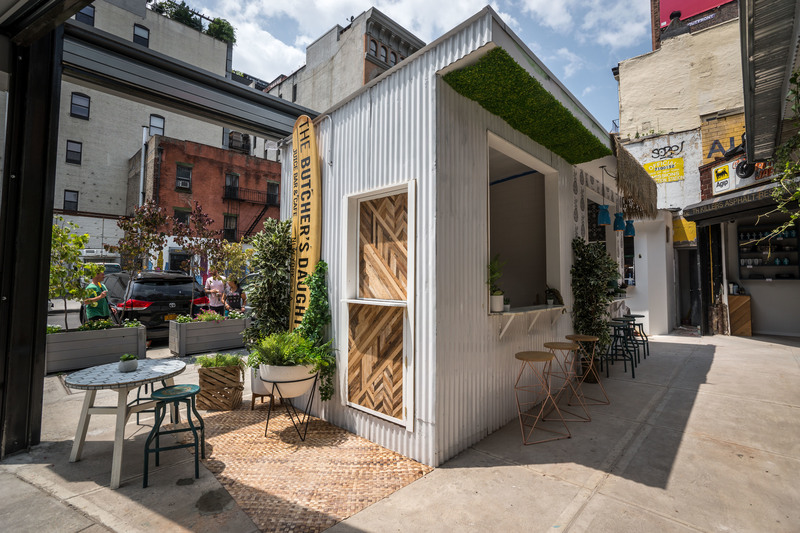 This East Village mini food hall is out in the open air, with crimped tin structures that give it a laid-back island-town vibe. With only five vendors, it’s less a destination for grazing from different stalls and more a place to go when you have a hankering for one of the (very quality) food options, but can’t get your dining party to agree. Team Sandwich and Team Taco can finally eat together in harmony. What to order: Sushi on the Jones offers the city’s only outdoor omakase, one of the best affordable tasting menus in NYC. Don’t let the casual fast-dining concept fool you—sushi chef David Bouhadana knows exactly what he’s doing. 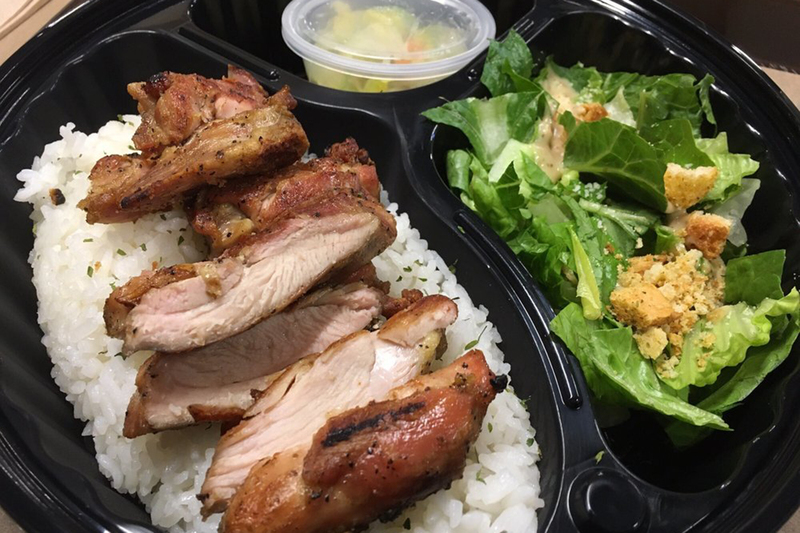 Located inside the Flushing mall, this may be a food court, not its own stand-alone hall, but that doesn’t change the basic concept: good food, diverse options. Wooden tables, high-stool seating areas, and an interesting wooden geometric motif add to an upscale design aesthetic that fly in the face of everything you think of when you hear the words “mall food court.” This goes for the food as well, with vendors curated to represent a diverse array of Asian cuisines. 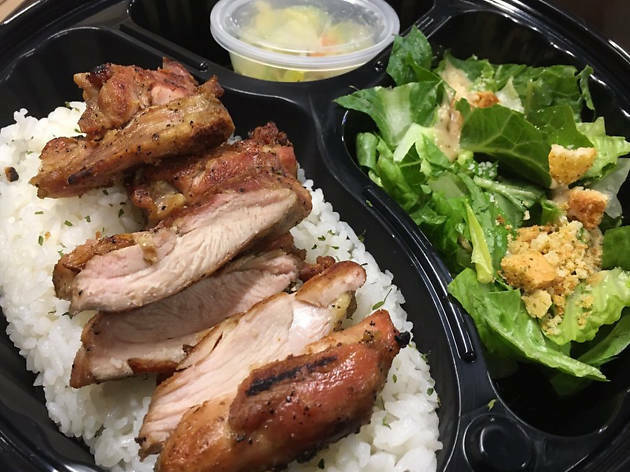 What to order: Queens Crossing mall unveiled a foodie haven on its second floor, with stalls like Happy Lemon touting Taiwanese bubble tea. 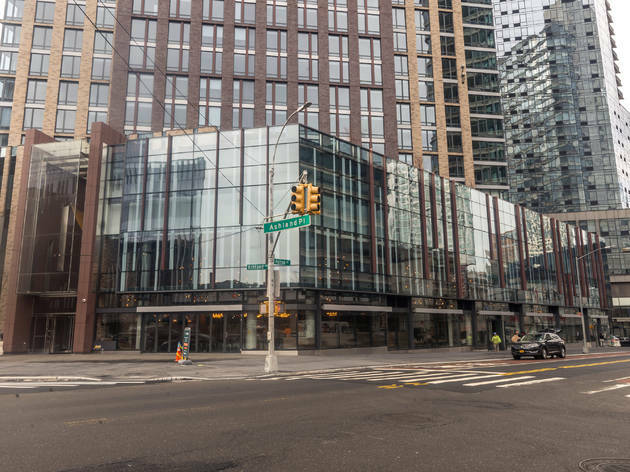 On the ground floor of a luxury residential building, this Fort Greene brother of Gotham West Market is Brooklyn’s newest food hall. High ceilings, plentiful seating, and colorful decorative lighting add a sheen of sophistication to the normally casual food-hall setting. 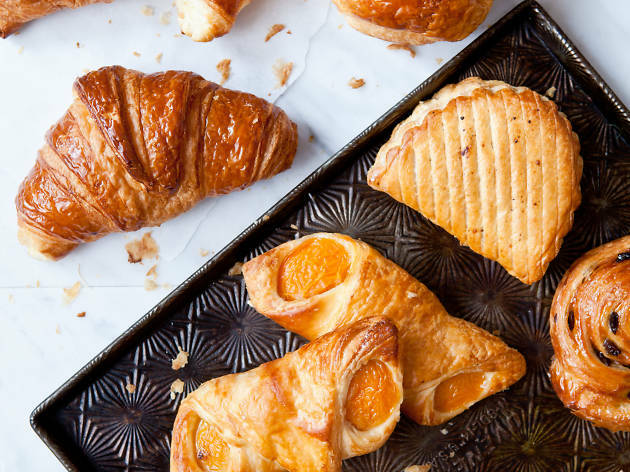 What to order:Sandwiches and pastries from Bolivian Llama Party, Manhattan’s only Bolivian restaurant. 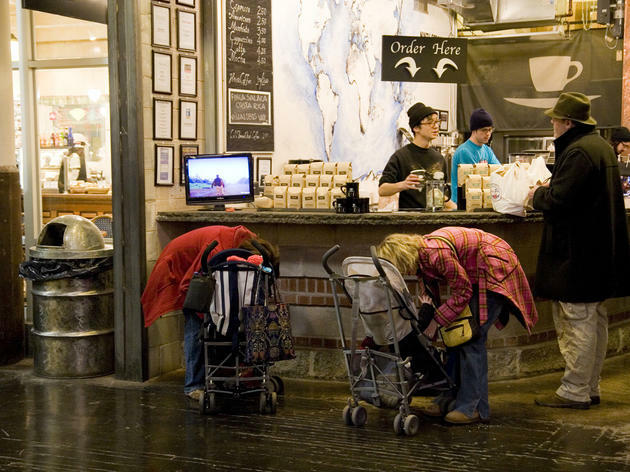 Roaming Chelsea Market is arguably some of the most fun you can have inside one city building. 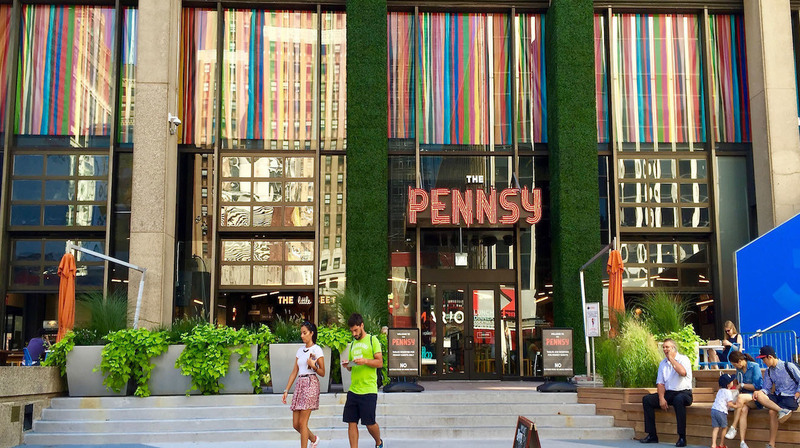 The Nabisco Oreo factory turned gourmet paradise is responsible for starting the city’s trend of collecting diverse food vendors under one roof, and this food-hall veteran has come a long way since its inception. 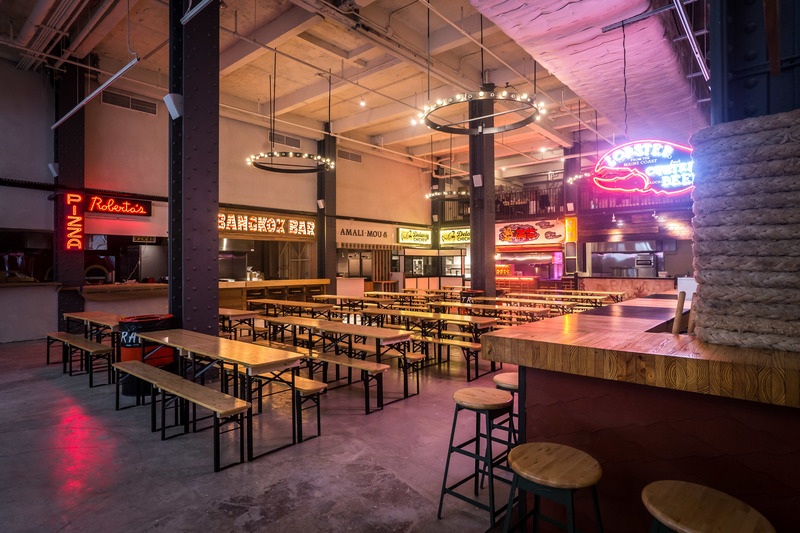 Today the factory-feel remains, adding nostalgic charm to a slew of stalls hawking epicurean delights, sit-down restaurants (making a total of 38 food options!) and shops. What to order: The folks from Chelsea Market’s ridiculously popular Los Tacos No. 1 have turned their attention to fresh seafood for spin-off Los Mariscos. Nosh on the Baja-style fish tacos and shrimp ceviche. Normally, New York subway stations are not places that induce an appetite; Turnstyle is perhaps the one exception. 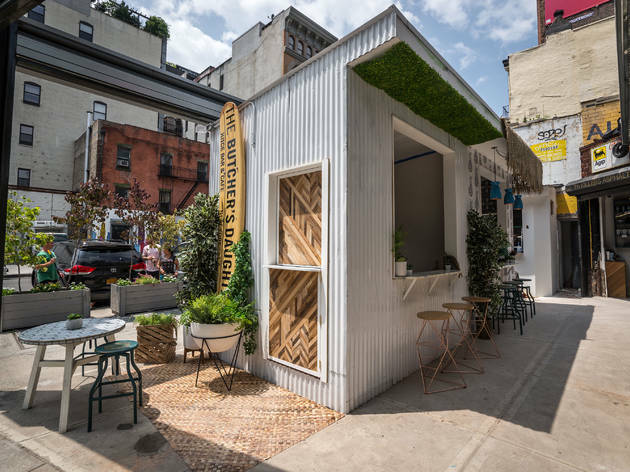 The developer carefully selected a crew of vendors to appeal to the tastes of different commuter demographics (teens on their way to school, lunch-seeking business folks, etc. ), and intentionally opted for mostly smaller, artisanal brands. What to order: Daa! Dumplings for the Russian version of your favorite on-the-go treat. 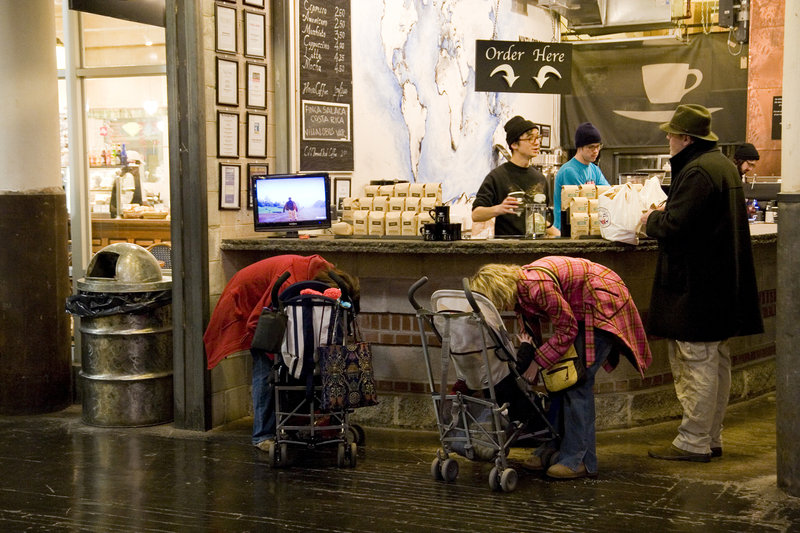 Unlike many food halls where diversity is the name of the game, Great Northern Food Hall devotes itself to Nordic food the way Eataly does for Italian. 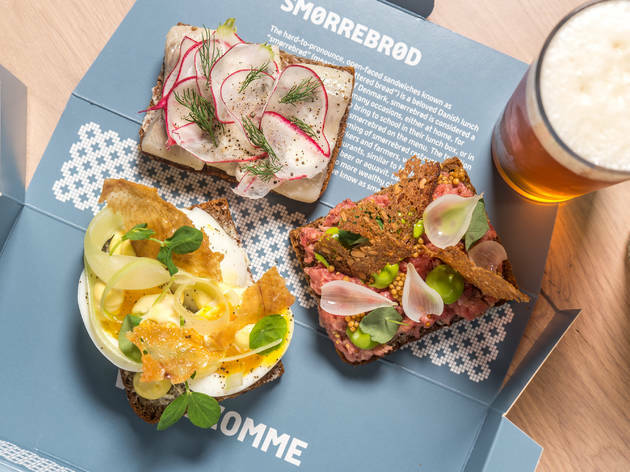 Danish restaurateur Claus Meyer—he of Noma fame—curated everything at this Grand Central Terminal food hall, and much of it may seem familiar if you love the farm-to-table concept. Think open-faced rye bread sandwiches, pickled herring, salads, baked goods, porridges and all- around delicious wholesomeness. 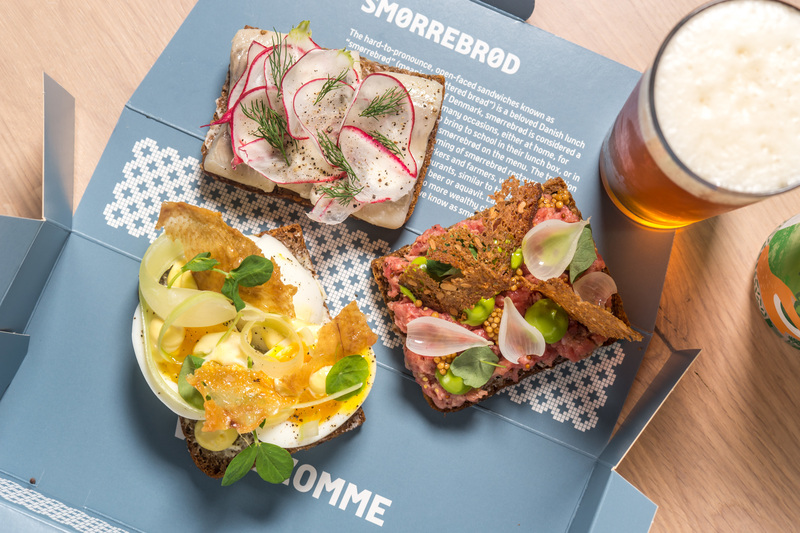 What to order: Traditional Danish open-faced sandwiches, or smørrebrød, from pavilion Open Rye. 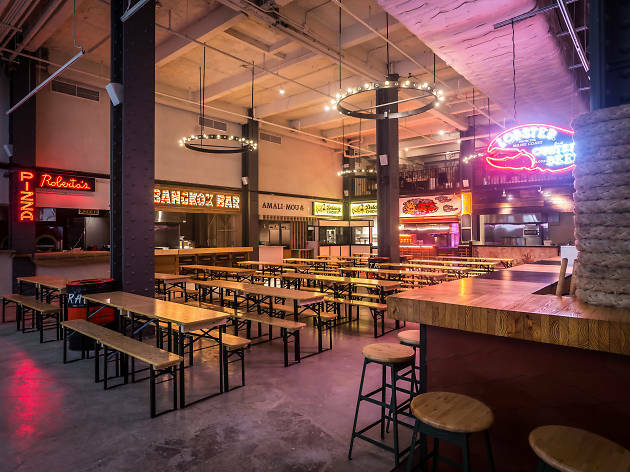 This addition to the city’s food hall scene sits inauspiciously above every New Yorker’s least favorite place: Penn Station. Luckily, it’s home to a number of quality vendors, from meat masters Pat LaFrieda to vegan junk-food slinger the Cinnamon Snail. What to order: One of the 30 rotating donuts and pastries from the Cinnamon Snail. Venue says Vegans, omnivores, pescetarians, gluten-free, and everything in between — we got you. 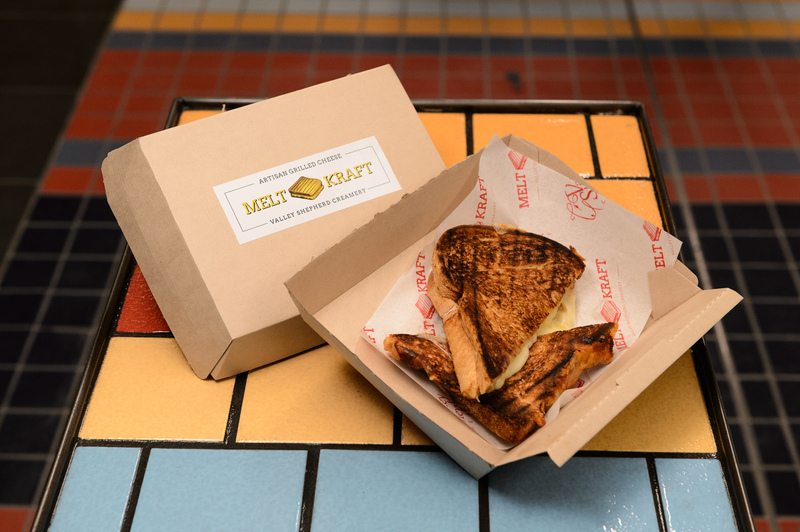 This Midtown spot changed the workaday lunch game when it opened on Park Avenue last fall. Twelve-thousand square feet of snacks served up by grade-A vendors like Bushwick’s Roberta’s and Ditmas Park’s Mimi’s Hummus, the hall quickly and efficiently made office workers’ sad desk lunches a thing of the past. 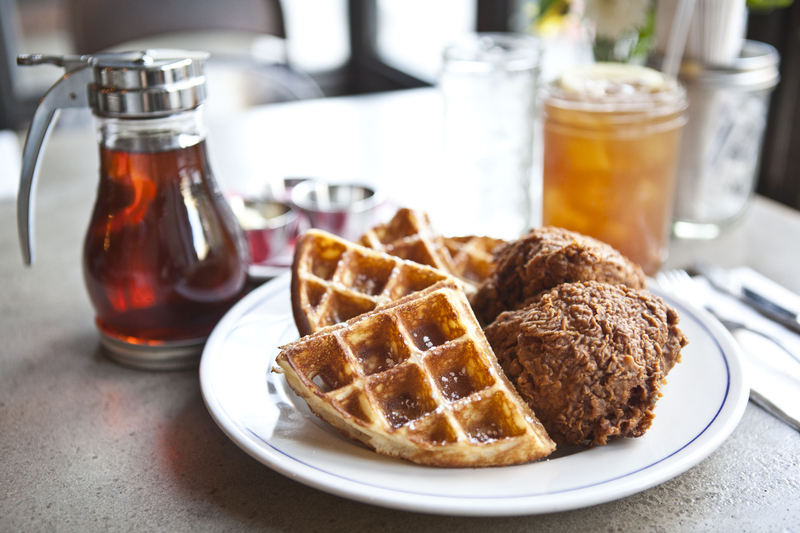 What to order: The fried chicken from Bobwhite Counter will be some of the best you've had outside the South.